The OralSmile Dental Clinic Tavira specialises in dental implants. Implantology is a surgical speciality dedicated to dental implants. 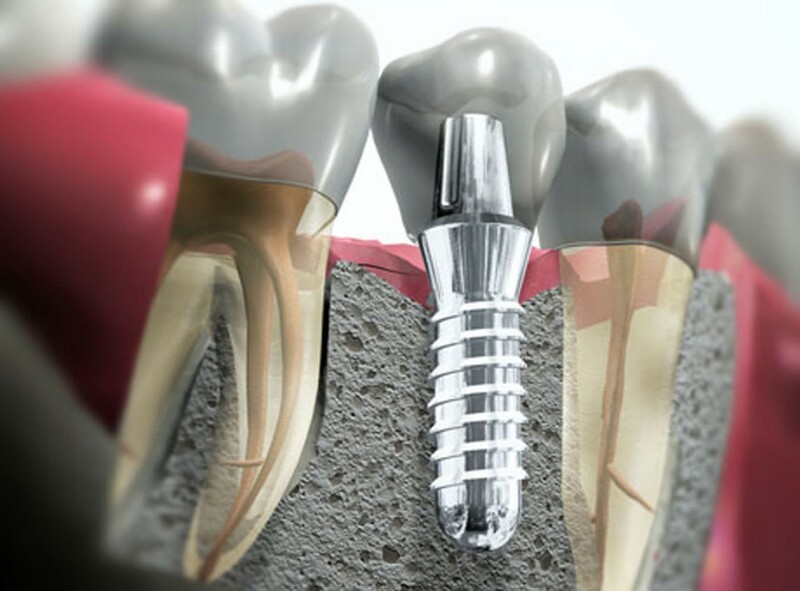 Dental implants are segments of pure titanium that replace the roots of missing teeth. Implants are placed in the maxilla or mandible. They offer a safe and permanent solution to the replacing one or more teeth and also function as support abutments for placing crowns and fixed and removable bridges. Dental implants, afford the patient a more comfortable and aesthetic solution to tooth replacement, and allow the patient to regain the feeling of comfort that natural teeth offer. – Restores chewing ability and proper mastication. – Maintains the integrity of neighbouring teeth, as the implants replace missing teeth naturally. – Increased confidence and wellbeing for the patient with a boost in self-confidence. Is there is possibility of rejection of an implant? What are the contraindications for the dental implant treatment? There certain systemic diseases which could delay the healing process. Habits such as smoking can cause post-operative healing to take longer. In all cases of dental implant surgery, a full medical history is taken accompanied by diagnostic tests, to assess specific surgical indications on a case by case basis. This allows the Dentist to prevent any side effects. How long does a dental implant last for? There is no set time for each implant, its duration is variable and depends mainly on the patient’s maintenance care of the implants. Proper oral hygiene and regular visits to the Dentist will ensure a good prognosis for longevity of the implants. There are reports of dental implants over 40 years old with optimal function. How often should Oral Hygiene appointments be made? An appointment is recommended every 3 to 6 months, depending on the oral hygiene of the patient. We recommended never going beyond a six month period between appointments. Do Oral Hygiene appointments maintain my implants? Oral hygiene is very important for teeth implants. Bacteria have a greater capacity to accumulate around the implant and lead to faster onset of infections. Therefore to protect your implants, proper hygiene and careful maintenance is essential to long-term durability. View the following video for a demonstration of a dental implant.